When the announcement was made this past year of the 2015 Nobel Prize in Physics, Notre Dame’s Professor John LoSecco was intimately familiar with both the winners and their prize-winning discoveries. LoSecco had, in fact, played a key role in the discovery of one of the anomalies for which the Prize was shared and which had upended physicists’ view of one of the most mysterious particles in the universe – the neutrino. 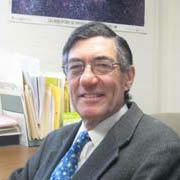 LoSecco has now published his recollections of the events surrounded the discovering of the “atmospheric neutrino anomaly” in the journal Physics in Perspective; they can also be downloaded at http://arxiv.org/abs/1606.00665. LoSecco’s article, entitled The History of “Anomalous” Neutrino Events: A First Person Account, is a fascinating case study in how experimental physics is done and how great discoveries can present themselves in places and ways entirely unexpected. In the 1980’s, LoSecco was a member of the IMB collaboration whose main goal was to check whether the proton, a fundamental building block for everything around us, can decay. Though the experiment found no sign of decaying protons (and neither has anyone since), the experiment did teach us a great deal about neutrinos, particles which bathe the universe but which interact so weakly as to be nearly undetectable. Among their findings, LoSecco and his colleagues observed a burst of neutrinos coming from a “nearby” supernova, SN1987A, the first such observation ever made, and one that revealed important information about the conditions inside the cores of collapsing stars. But of more relevance to the recent Nobel, they also discovered in 1986 a strange anomaly in their data when they examined neutrinos produced by cosmic rays entering our atmosphere. By the 1980’s, the panoply of particles and forces observed in nature had been understood within the framework of the so-called Standard Model. This model included neutrinos among those particles, but it was understood that neutrinos were massless particles, like photons of light. Further, physicists in earlier years had been surprised to find that neutrinos came in three types, or “flavors”. IMB was capable of detecting the presence of two of these types of neutrinos, but the ratio of the two types did not match theoretical expectations. As recounted in LoSecco’s paper, the collaboration struggled to determine whether this deviation was experimental error, a signal for unknown physics, or something else entirely. In the process, LoSecco began discussions with a competing Japanese experiment, Kamiokande, which was similar in design and had published a result without any deviation. The memoirs discuss the interesting back and forth within the IMB collaboration, and between IMB and Kamiokande, as each worked to interpret their own data. By 1988, Kamiokande agreed that that the deviation was also present in their data, and several years later an upgraded SuperKamiokande was able to prove that the effect was real and could only be explained by neutrinos having a non-zero mass, overturning an important piece of the Standard Model. But perhaps the most thrilling story is how a group of physicists set out to study the proton, and instead changed our view of the neutrino and its properties. As US physicists prepare to launch the next era of neutrino discovery by sending a beam of neutrinos underground from Illinois to South Dakota, LoSecco’s memoirs are a reminder that the potential for discovery when doing frontier science is often greater, and more unexpected in its form, than we could ever imagine. Originally published by Notre Dame Physics at physics.nd.edu on August 15, 2016.